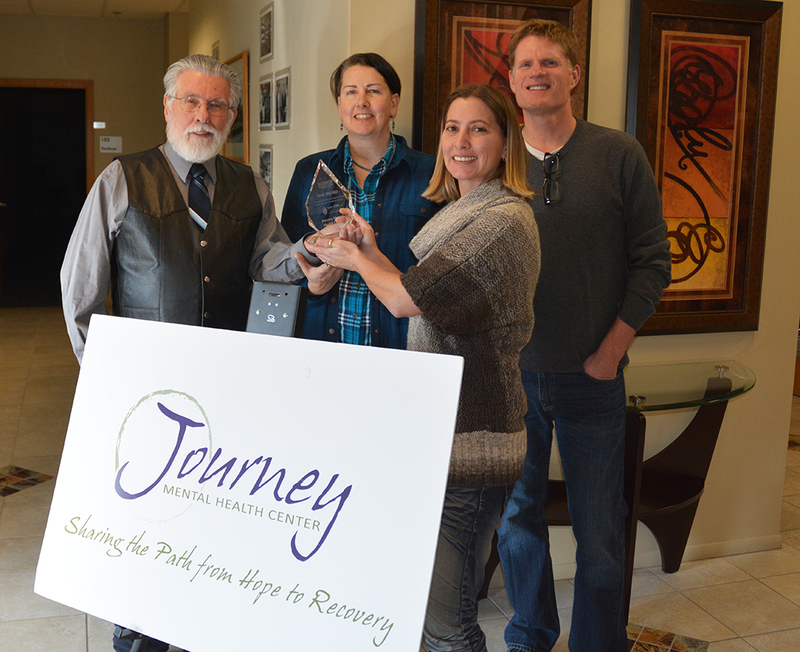 From left: WiNTiP Managing Consultant David “Mac” Macmaster presents the award named in his honor to Kathryn Rindy, Saima Chauhan and Michael Wiltse of Journey Mental Health for their work to help behavioral health patients quit tobacco use, and to make their campus tobacco-free. The Wisconsin Nicotine Treatment Integration Project (WINTIP) was launched in 2008. WINTIP has been advocating tobacco integration in Wisconsin behavioral-health services for 10 years now. What has happened in this WINTIP decade? For one thing, our best information is that at least 70,000 Wisconsin residents have died at approximately 7,000 tobacco deaths a year. We believe at least 40% of those tobacco deaths are individuals with substance use and mental-health disorders, or 30,000 residents at 3,000/year. What is a Wisconsin life worth? Is a 20-year old who dies from an opioid overdose more important than a person that dies from an alcohol-related liver disease or a fatal car accident or fall or other drug-related deaths? Are those who die from a tobacco caused or related disease less important to family members who love and need them than somebody who dies from another substance use disorder? If all those Wisconsin residents are still dying from tobacco even with WINTIP advocating for tobacco integration in behavioral health for 10 years, what good has come from WINTIP? Good question. What if there were more treatment and recovery opportunities for people with tobacco-use disorders to become tobacco-free than exist today? Our public health models for smoking cessation have been remarkably effective. However, there are those with more severe nicotine dependence that need more comprehensive treatment and recovery for their chronic tobacco-use disorders. The reality is that Wisconsin residents with tobacco-use disorders that could be helped by established addiction treatment have not been eligible to receive that treatment in Wisconsin’s substance-use disorder/addiction-treatment programs. They have been denied the comprehensive treatment available to those with other substance-use disorders like opioid, cocaine, alcohol-use disorders. WINTIP has worked for a decade to change that discrimination against Wisconsin residents with tobacco-use disorders as well as mental-health disorders. How many lives will be saved when those with severe tobacco-use disorders have access to a source of tobacco treatment and recovery support they never had before? If substance-use treatment has been proven to be effective for all the substance-use disorders for nearly 50 years, hopefully it will be equally effective for those suffering and dying from tobacco-use disorders. WINTIP was conceived and created to remedy that public health oversight. WINTIP works tirelessly to make tobacco integration in behavioral health services successful and fulfill its mission of saving Wisconsin lives from death by tobacco. WINTIP adopted a tobacco-integration formula of “Buy-in + Training + Resources = Tobacco Integration Implementation.” WINTIP has spent a decade addressing this tobacco-integration formula, and has made significant progress. As our WINTIP Decade concludes, we believe WINTIP is ready to achieve our primary mission of successful tobacco integration in our Wisconsin Substance Use Disorder services. Wisconsin’s DHS75 rule, governing substance-use disorders, is in a rule-revision process. WINTIP plans to create an effective presentation, making the case for our tobacco integration in behavioral health during this DHS75 revision process. It is our goal to have the treatment of tobacco-use disorders accepted as an essential requirement in all behavioral-health providers’ scope of practice. WINTIP has identified the tobacco mortality data for the WINTIP Decade. We obtained the prevalence data which confirms that, while the Wisconsin rate of tobacco smoking in the general adult population has been reduced to less than 15 percent, smoking is prevalent at from 80 to 90 percent in those admitted for treatment for substance-use disorders. High prevalence of tobacco-use disorders is also common in those with mental-health disorders. In fact, high prevalence of tobacco-use disorders results in a higher tobacco disease and death rate. WINTIP reviewed Wisconsin excise tax collections from tobacco and alcohol during the WINTIP Decade. We learned that the 14 percent of Wisconsin smokers provide 10 times more state general revenue than from the 68 percent of Wisconsin residents that purchase alcohol products. There is plenty of money to pay for tobacco-use disorder treatment. In summary, the Wisconsin tobacco death toll is consistently too high at 7,000 a year with 3,000 casualties in our behavioral-health populations. Yes, the current public health model of smoking-cessation services is saving Wisconsin lives. However, many more Wisconsin lives will be saved when the WINTIP tobacco-integration mission successfully opens access for Wisconsin residents with tobacco-use disorders, so they receive the comprehensive substance-use-disorder treatment they need and deserve. The WINTIP Decade accomplished a lot with a little. We are grateful for the WINTIP Decade. Without WINTIP, it is doubtful tobacco integration in Wisconsin behavioral health services would have become an issue worth supporting as a priority public health issue. Thanks to UW-Center for Tobacco Research and Intervention for designing and coordinating WINTIP. Thanks to the original WINTIP Advisory Group for their direction and leadership. Thanks also, to Wisconsin Tobacco Prevention and Control and its leaders for making WINTIP possible. Finally, thanks to all the WINTIP stakeholders including the Division of Care and Treatment Bureau of Prevention, Treatment and Recovery for their continuing advocacy. For more information on helping behavioral health patients quit smoking, chewing, and vaping nicotine, visit www.HelpUsQuit.org.